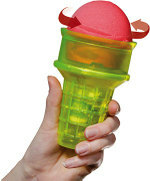 Can you tell me if you sell or know of anyone that sells coffee mugs that look like ice cream cones? 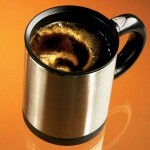 I totally get the self-stirring coffee mug. This technology has been around for awhile. I first encountered the 'self-stirrer' in chemistry lab when you had to stir heated solutions for hours on end. I wish that they had one for a pot to heat water, because boiling can be reduced in time by almost 40% by continously stirring it, especially when using a gas-stove top. In addition, an auto stirrer would be nice for my french press so that the grounds will be fully soaked and released of their wonderful flavor in a shorter amount of time. I first saw the rotating ice-cream cone on 'Food Network'. That is quite possibly the dumbest thing I have ever seen. In fact, it really made me angry. What ever happend to enjoying something despite its problems, ie the dripping ice cream mess? Oh My! are there really that many lazy people, or maybe those who like crazy gadgets?